Wrestling- For your party.... LET'S GET READY TO R-U-M-BL-E!! 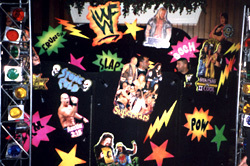 Bring in this Wrestling Superstars theme with a full 3 dimensional D.J. Booth in black light reflective colors with stobes. It spans up to 30 ft. across and 15 ft. high for the maximum carnage. This setup will smack down all the other D.J. Booths seen all year (not from Party Sensation, of course). Have all of your favorite wrestlers attend your party and make it the steel cage event everyone will talk about. For the true wrestling fan, any other show will be out for the 3 count. 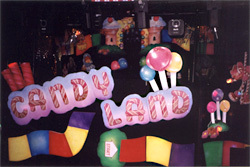 Candyland- This is truly the sweetest D.J. setup you'll find. We've brought this popular game to life for your party, complete with all the characters and games board you know well. This extremely colorful booth design will light up any room and let your guests know they're not just attending any plain old party. Trimmed with black lighting, strobes, and full of sugar and spice, your show will be a welcome change from the standard look of a D.J. production.